39 and Holding Club: 39ers' ROCK-tober! Great 39er Rockers share this month’s limelight, with notable pumpkin-flavored birthdays – keep the beat with Chuck Berry (Oct. 18), explore the inane with Weird Al (Oct. 23), and lead us to temptation, with Otis Williams, last surviving member of The Temptations (Oct. 30). Best of all, it’s the month when adults get to be kids again and dress up for Halloween. What more could you want?! Ummmm, how about a zombie-style cocktail? Yum-rum! What’s the Zodiac stirring up this spooky month? October UN-birthday buddies split their astro time between Libra and Scorpio … You would think Libra’s gentle sense of balance and order would clash with Scorpio’s intense and pulsing passion. Whatever you do for your fave October 39er or for yourself – enjoy the crisp air and golden-orange leaves of fall, on a stroll down Mockingbird Lane. 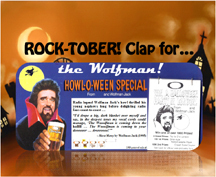 Wave to Herman and Lily Munster – and let out a long, soulful Wolfman Jack Halloween hoooowwwwll!